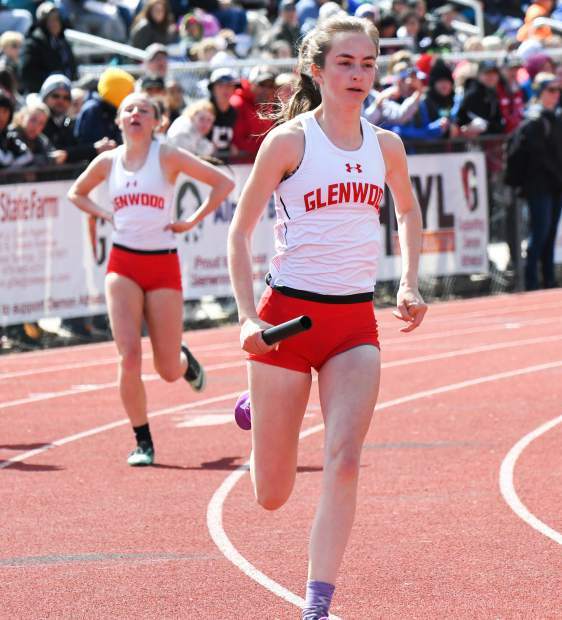 Glenwood senior Emily Worline takes off after receiving the baton from teammate Hadley Yellico in a relay event at the Demon Invitational Saturday. 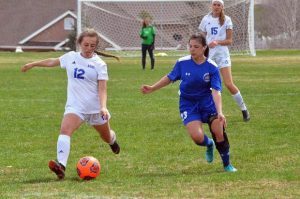 When it comes to the Demon Invitational as of late, Glenwood Springs head coach Blake Risner can count on his athletes winning the invitational outright. 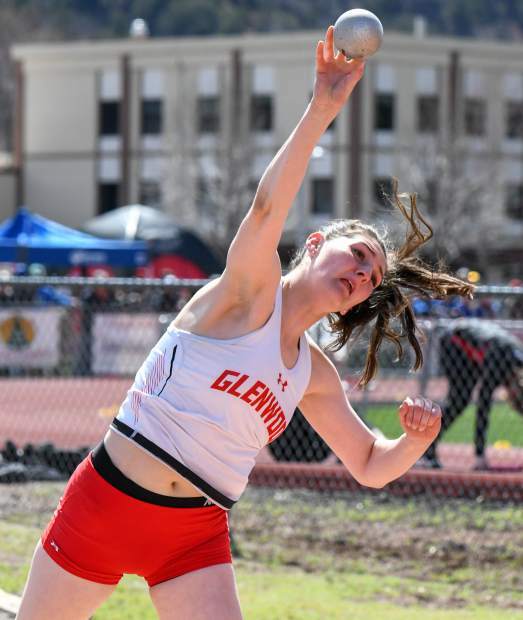 For the second straight year at Stubler Memorial Field, the Glenwood boys and girls swept the invitational, as the boys cruised to a win with 190 points, while the girls pulled out the win late, thanks to senior Payten Spencer’s work in the discus, giving the girls 77 points to hold off Cedaredge. The win for the boys marks the fifth straight year that Glenwood has taken the boys title, meaning the seniors on the boys’ team didn’t taste defeat at home in all four years competing at the varsity level under Risner, while it’s the second year in a row for the girls. 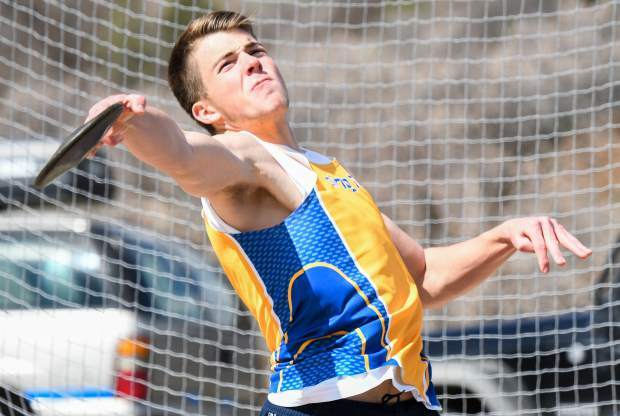 The boys though showed a level of dominance rarely seen in high school track and field on Saturday. “We’ve known since they were freshman that we had a special group,” said Risner following the completion of the 39th annual Demon Invitational. 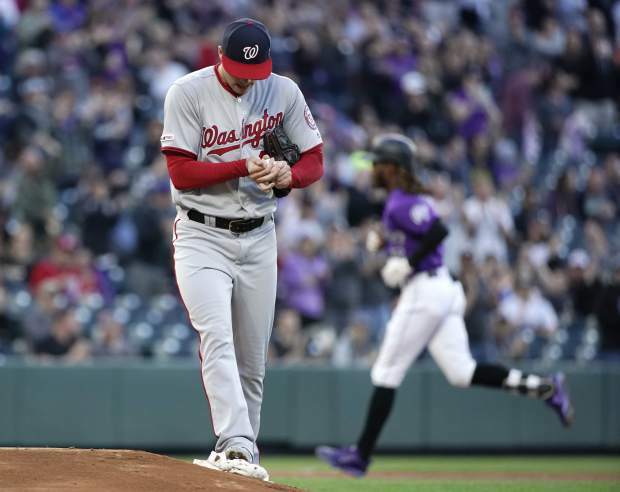 “More imporatntly, the boys stuck together and had a lot of pride. We try to win two meets a year ­— our invitational and league championships. When we reminded the youngsters what we were trying to here today, they really stepped up and helped the upperclassmen. The Glenwood boys put the home meet away early, cruising to the invitational win by 133 points, with Cedaredge (57), Paonia (50), Vail Christian (42), and Steamboat Springs (38) rounding out the top 5 for the boys. Rifle finished 11th with 22 points, while Grand Valley and Roaring Fork finished 12th and 13th respectively, with 20 and 17 points each. 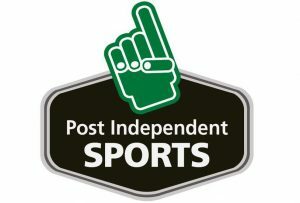 It was much closer in the girls’ standings as Glenwood Springs senior Payten Spencer ensured a second straight Glenwood home invitational championship with a third-place finish in the discus, leading the Glenwood girls to 77 team points, good enough to edge Meeker in second with 74 points. Behind Glenwood and Meeker, Cedaredge placed third with 71 points, while Paonia, Grand Valley, and Rifle rounded out the top 5 with 56, 55, and 55 points each. The Coal Ridge girls placed 14th with 10.3333 points, while Roaring Fork placed 16th with 7 points. Opening up the invitational Friday with the pole vault, Coal Ridge’s Phoebe Young amd Rifle’s Ashley Manera placed first and second in the girls’ pole vault. Young cleared 10-01.00, while Manera cleared 9-07.00. In the boys’ pole vault, Glenwood’s Jacob Wolf grabbed a fourth-place finish for the Demons by clearing 11-07.00, getting the Demons off to a fast start. On Saturday, things kicked off with the girls 800m sprint medley relays and the girls discus. In the 800m, Basalt’s Megan Maley won the event with a time of 2:27.39, while Glenwood’s Sophia Vigil placed fourth with a time of 2:35.60. Over in the discus, Spencer eventually placed third for the Demons with a toss of 103-02, finishing behind two Meeker athletes. In the third event of the day, the Glenwood boys’ 4x800m relay team of Dalton Deter, Reid Swanson, Alec Nykerk, and William Berkheimer placed third for the Demons, clocking a time of 9:05.21. As the day progressed, Glenwood’s Sequoia Kellogg had a great performance in the girls high jump for the Demons, tying the school record with a mark of 5-02.00 on the cold, snowy day. Things started to heat up for the girls as a trio of local athletes placed in the top 5 in the 100m dash. Rifle’s Delaney Phillips placed second for the Bears with a time of 12.99, while Grand Valley’s Shaya Chenoweth placed fourth with a time of 13.03. Roaring Fork’s Lily Nieslanik placed fifth with a time of 13.17 seconds. Phillips then grabbed a second-place finish in the 200m for the Bears, clocking a time of 27.26 seconds, before then winning the 400m dash with a time of 1:01.58, edging Glenwood’s Emily Worline in second with a time of 1:02.00, and Glenwood’s Daniela Barajas-Lee in fourth with a time of 1:05.30. The 3200m saw Glenwood’s Alexa Helms and Rifle’s Karisa Combs place second and fourth as Helms clocked a time of 12:54.79, while Coombs clocked a time of 13:08.65. In hurdles, Glenwood’s Emma Barsness placed fifth for the Demons in the 100m hurdles with a time of 18.08 seconds, while Grand Valley’s Alex Mendoza and Glenwood’s Vigil placed third and fifth in the 300m hurdles with times of 50.64 seconds, and 50.76 seconds, respectively. Relay events saw the Glenwood girls turn in a strong performance as the 4x200m relay team of Barajas-Lee, Hadley Yellico, Worline, and Vigil placed second with a time of 1:50.33. In the 800m sprint medley, Grand Valley and Glenwood finished 1-2 as Grand Valley’s relay team of Mendoza, Ryley Sackett, Chenoweth, and Jordyn Pittman clocked a time of 1:53.82, while Glenwood’s relay team of Spencer, Yellico, Worline, and Vigil recorded a time of 1:53.89. The girls’ long jump saw local athletes finish in the top 5 as Chenoweth won the event for the Cardinals with a jump of 16-08.50, while Kellogg placed second for Glenwood with a distance of 16-01.50. Sackett placed third for the Cardinals with a jump of 15-0.00, while Rifle’s Maddy Valencia and Glenwood’s Yellico placed fourth and fifth with distances of 14-11.50 and 14-11.00. The triple jump also saw Sackett and Valencia finish second and third with distances of 31-09.50 and 31-05.00, respectively. In boys events, Glenwood started fast and never looked back. 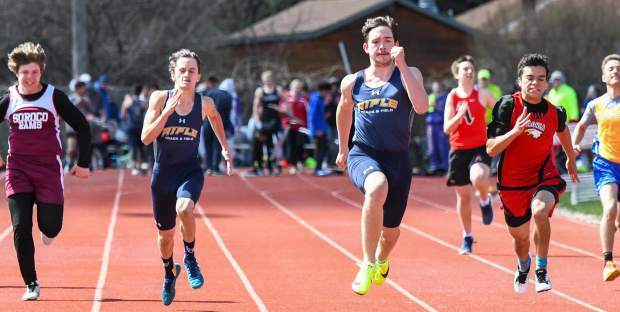 After an early start led to a disqualification for standout sprinter Gavin Olson – one of the top sprinters in the state – in the 100m dash, Glenwood junior Kuba Bartnik picked up the pace for the Demons in the event and clocked a winning time of 11.32 seconds. Teammate Ale Angeles placed second with a time of 11.62 seconds in the sprint. In the 200, Bartnik picked up another win, clocking a time of 23.56 seconds, holding off Rifle teammates Bryce Schanche and Embrey Maratino in second and third with times of 23.91 and 24.39 seconds. Olson bounced back in the 400m for the Demons, running away with a win by more than a second, clocking a time of 51.57 seconds. Rifle’s Schanche placed third in the event with a time of 53.30 seconds. The 800m saw Roaring Fork’s Ronald Clemente place third with a time of 2:09.43, while Glenwood’s Gavin Harden and Henry Barth rolled to a 1-2 finish in the 1600m ahead of Clemente in third with times of 4:28.70, and 4:3.64, respectively. Barth then went on to win the 3200m for the Demons with a time of 10:02.98, while Glenwood freshman Reid Swanson placed third wth a time of 10:48.31. In hurdles, Glenwood’s Bryce Risner won the 110m hurdles with a time of 15.56 seconds after tying a personal best in the prelims with a time of 15.27 seconds. Jacob Wolf and Taber Uyehara placed third and fourth for the Demons in the event with times of 16.46 and 16.55 seconds. In the 300m hurdles, Glenwood finished 1-2-3-4 as senior Wyatt Ewer won the event with a time of 40.79 seconds, edging Risner in second with a time of 40.95 seconds. Wolf placed third with a time of 42.37 seconds, while Uyehara placed fourth with a time of 42.76 seconds. 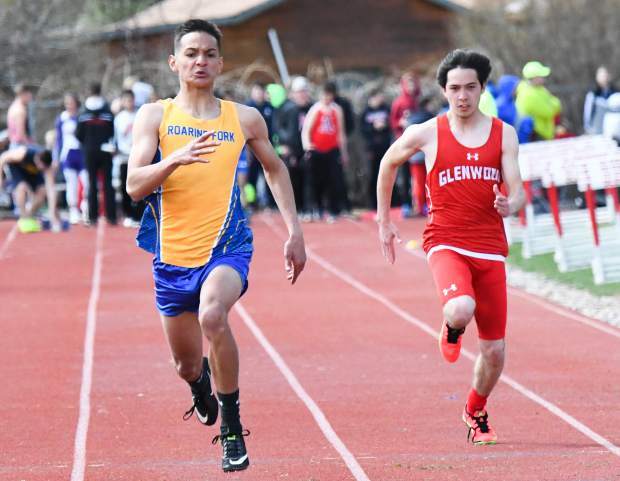 Glenwood’s 4x200m relay team later claimed a win as the team of Bartnik, Risner, Ewer and Olson clocked a time of 1:32.59 seconds, while the Glenwood 4x400m relay team also won its event as the team of Angeles, Brian Delgado, Patrick Young, and Ewer clocked a time of 3:34.63 seconds. In the high jump, Risner and teammate AJ Adams placed second and fourth for the Demons, clearing heights of 6-03.00, and 5-11.00, while Ewer won the long jump for Glenwood with a distance of 20-11.00. Closing out the invitational in field events, Glenwood’s Geffrey Oliva placed second in the triple jump with a distance of 39-0.00, while Grand Valley’s Justin Andrews won the shot put and with a throw of 45-06.00. 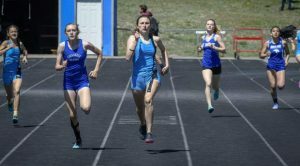 Looking to build off of the Demon Invitational wins, Glenwood will take a select number of athletes to the tough Dakota Ridge Invitational on April 20.